In May 1850 a young man stepped off a ship in San Francisco. Nothing remarkable there. Thousands of young men were arriving in San Francisco on their way to the goldfields. Like the others, this young man had come to California to seek for gold. But he hadn’t joined the Gold Rush to get rich. He just wanted to get home. The young man was an Asian, but with a difference. 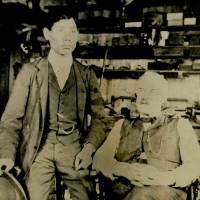 He was not Chinese, like the other Asian immigrants beginning to come to Gold Mountain — he was Japanese, and he must have been the only native of Japan in California. His name was Manjiro. He was born in a fishing village in 1827, and by the time he was nine years old his father had died and he was left to support his mother and siblings. So from that young age he worked the fishing boats. Then at the age of 14, he and his five companions were shipwrecked. For five months they nearly starved on a small rocky island until they were picked up by a New England whaling ship. It was impossible for them to be taken back to Japan. Foreign ships were not allowed to land on the coast of Japan, even to return rescued fishermen, and if they left, even accidentally, Japanese citizens could not return to their homeland on pain of death. A photo, possibly showing Manjiro as a young man, recently found in the New Bedford Public Library. So Manjiro went with Captain William Whitfield to New Bedford, Massachusetts. On board ship, he began learning English, and the captain, impressed by the boy’s intelligence and attentiveness, taught him piloting and seamanship. In New Bedford he was enrolled in school and continued his education in language, mathematics, and navigation. Captain Whitfield and his wife treated Manjiro, whom they called John Mung, as their adopted son. Throughout his sojourn in the United States, Manjiro suffered from homesickness. He longed to see his native land once more. He yearned for his mother and worried that she was living in poverty and distress without her eldest son to care for her. But how could he return to Japan? How would he find the means to make the voyage? What ship could take him there? And if he did find a way to get to Japan, how would he be treated? What good would it do his mother if he were arrested and executed on his return? More about Manjiro and his return to his homeland next time. For information about the photo, see this article in the Japan Times. This entry was posted in Uncategorized and tagged Manjiro. Bookmark the permalink.